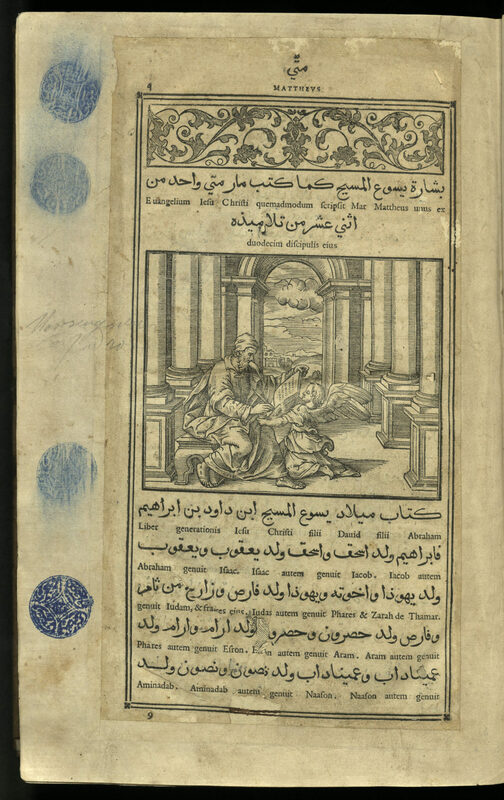 Bashārat Yasuʻ al-Masīḥ, the first printed edition of the Gospels in Arabic, is the first production by the Typographia Medicea press, a printing house established by Pope Gregory XIII and Cardinal Ferdinando de’ Medici in order to promote and distribute Christian scripture to the Near East. Two issues of this work were printed, apparently simultaneously. 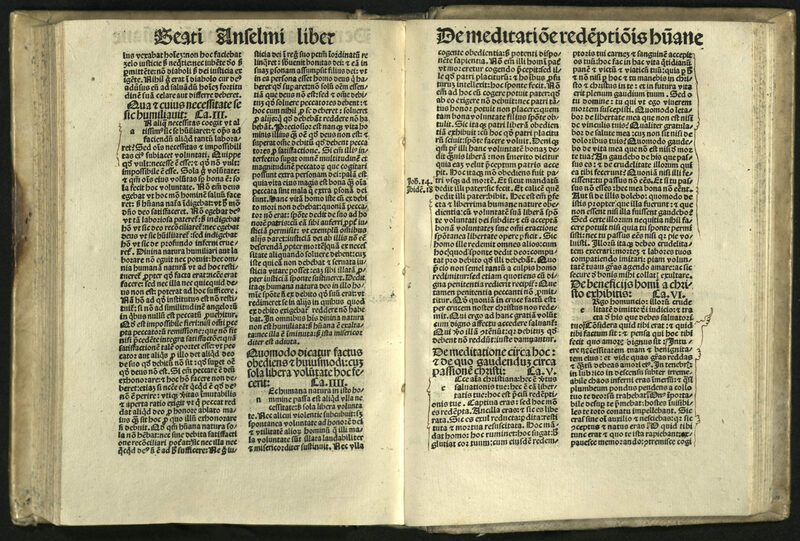 One had Arabic-only text and was printed in an edition of 4,000 copies. 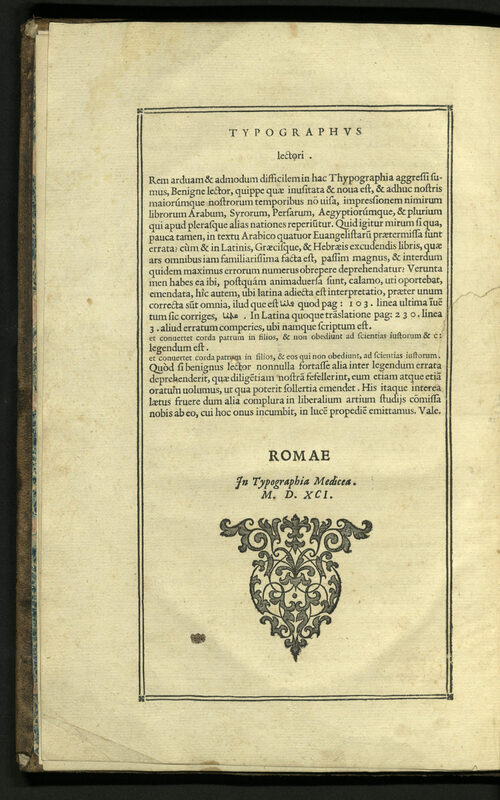 The other, here, was printed in Arabic with interlinear Latin, in an edition of 3,000 copies. The Arabic-only edition has the date 1590 on the title-page, but 1591 in the colophon. 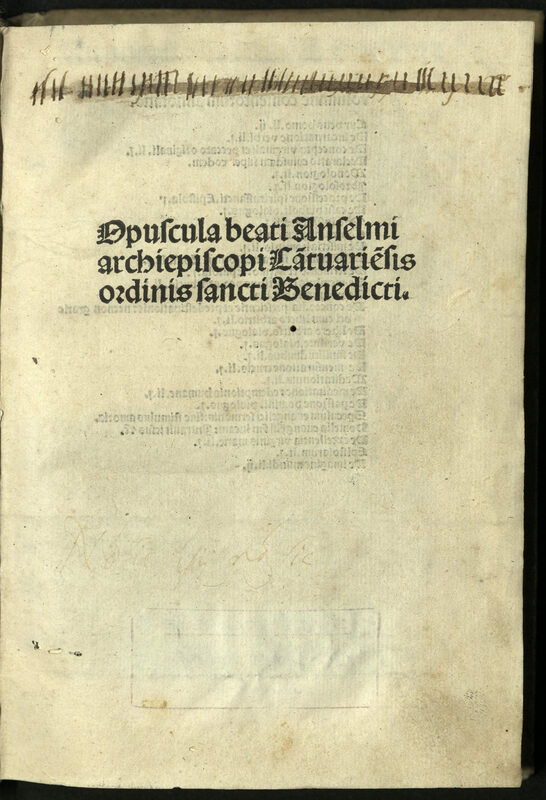 Allegedly, a few of the bi-lingual copies were published with a preliminary leaf stating, “Sanctum Dei evangelium arab.-lat.” No known copies of this half-title are known to exist and this leaf may never have existed. 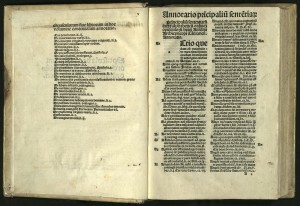 With a Latin translation ascribed to one Antonius Sionita, the book was edited by Giovanni Battista Raimondi (1540-ca. 1614), an esteemed Orientalist and professor of mathematics at the College of Sapienza in Rome. Raimondi travelled extensively in the Near East and was knowledgeable, if not fluent, in Arabic, Armenian, Syrian and Hebrew. His fame rests with the editorship of the Typographica Medicea. He and French typographer Robert Granjon, who created the Arabic font used in this work, were both recognized then and now for the earliest and best attempts to print Arabic in Europe. Illustrated with 149 woodcuts, printed from 68 blocks, engraved by Leonardo Parasole (ca. 1587-ca. 1630). The artist, Antonio Tempesta (1555-1630), studied under Santi di Tito and Flemish artist Joannes Stradanus at the Accademia del Disgno. Tempesta later worked with Stradanus and Giorgio Vasari (1511-1574) on the interior decoration of the Palazzo Vecchio in Florence. Tempesta then travelled to Rome, where he fulfilled several commissions, including frescoes for Pope Gregory XIII in the Vatican and panel paintings for the Villa Farnese. Many of the woodcuts are signed with the initials “AT” (Antonio Tempesta) and “LP” (Leonardo Parasole). The illustrations in Bashārat Yasuʻ al-Masīḥ are excellent examples of Tempesta’s work, noteworthy for their clear composition and narrative of the episodes depicted. Be that as it may, the illustrations may have played a part in the failure of this book to reach, let alone convince, its intended Islamic audience. Islam forbade religious illustration and these may have made the Gospels appear less than sacred, if not sacrilegious, to Arab Muslim readers. To be fair, the Christian church had a long tradition of presenting their message with religious illustrations. As far back as the sixth century, Pope Gregory defended the value of such imagery, arguing that pictures were useful for teaching the faith to the unconverted and for conveying sacred stories to the illiterate. According to Bede, St. Augustine introduced Christianity to the heathen King Ethelbert of Kent, upon landing on the British Isles, by presenting a picture of Christ painted on a wooden panel. He then began to preach. The Pope seems also to have denied the fact that more Christians lived in the Ottoman Empire than in any other European state. The first printed book in Arabic was a Book of Hours, probably intended for export to Syrian Christians. But these Christians were adherents to the Eastern Orthodox Church, not the Pope’s Roman Catholic Church. Christianity was hardly unknown in the predominantly Muslim Ottoman and Persian Empires. The Ottomans were, however, Christian Europe’s major military and political concern. 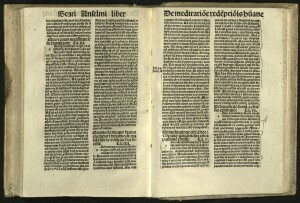 In addition to printing the Gospels in Arabic, Ferdinando de’ Medici charged Raimondi with printing “all available Arabic books on permissable human science which had no religious content in order to introduce the art of printing to the Mohamedan community.” Despite the superb quality — textually, typographically, and artistically — of its work, the Medici press was an economic failure and went bankrupt in 1610. The fact is that Raimondi displayed little understanding of Islamic culture. Although Raimondi’s selection of publications was not aimed at European scholars, his choices stimulated a study of the Near East in Europe. It would be more than a century after the Medici Press closed that Ibrahim Muteferrika, a Hungarian convert to Islam, was given permission by Sultan Ahmed III (1673-1736) to open his printing house in Istanbul, in 1729. This was not the first printing press established in the Near East, but it was the first Eastern press to print in Arabic using movable type. Arabic and small roman type text within double-ruled borders. Colophon and printer’s note to reader in Latin. 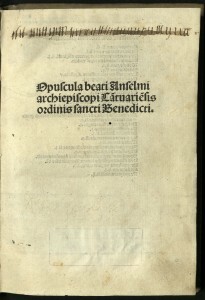 Colophon decorated with large woodcut arabesque. Rare Books copy bound in full, eighteenth century, sprinkled calf, with a gilt spine containing two burgundy morocco labels, and decorative gilt borders on the covers. The first leaf is shaved and reinserted on contemporary paper. This leaf contains four Waqf stamps, indicating the authentication of the Arabic translation. As in most copies, our copy lacks a title page. A former owner’s penciled inscription, “Alessio Dra Saggeto/en Aleppo 1871,” is on the free front end paper. Another signature, in ink, is at the top of the back free end paper. 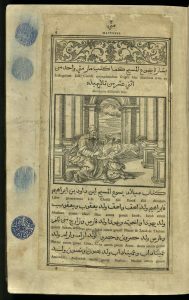 For more on the woodcuts, see Field, Richard S. Antonio Tempesta’s Blocks and Woodcuts for the Medicean 1591 Arabic Gospels, NE662 T45 F54 2001, in the rare book collections. 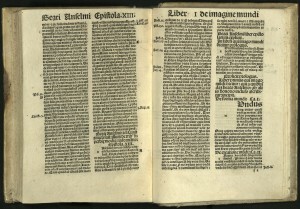 The first edition of the collected works of St Anselm was printed in Nuremberg in 1491. After St Augustine and Thomas More, St Anselm was one of the most widely read of Christian theological writers in western Europe. His influence was far-reaching. 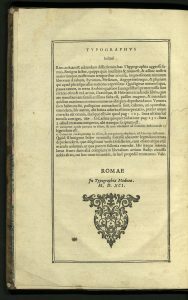 This collection includes his three most famous works: the Cur Deus Homo, a treatise on the atonement; the Proslogion, which contains his argument for the existence of God; and the Monologion. The last thirty pages of this volume is a two-part geographical astronomical/astrological compendium, “De imagine mundi,” dating from about 1100, containing chapters on India, Parthia, Mesopotamia, Syria, Palestine, Egypt, the Caucasus, Asia Minor, Europe, Africa and sections on islands and water (seas, oceans, tides). There are a few articles on the zodiac, and more on astronomy. Anselm describes celestial motions of the sun, moon and Jupiter, with reference to the solar and lunar cycles and the importance of their measurement for calculating time. Anselm notes different divisions of time as reckoned by the ancient Hebrews, Egyptians, Greeks, and Romans. He addresses various calendars and the cycles and divisions on which they were based. He notes the practical importance of their use for calculating astronomical events such as the equinox and solstice, and the sacred importance of calculating Easter. Printer Johann Amerbach (ca. 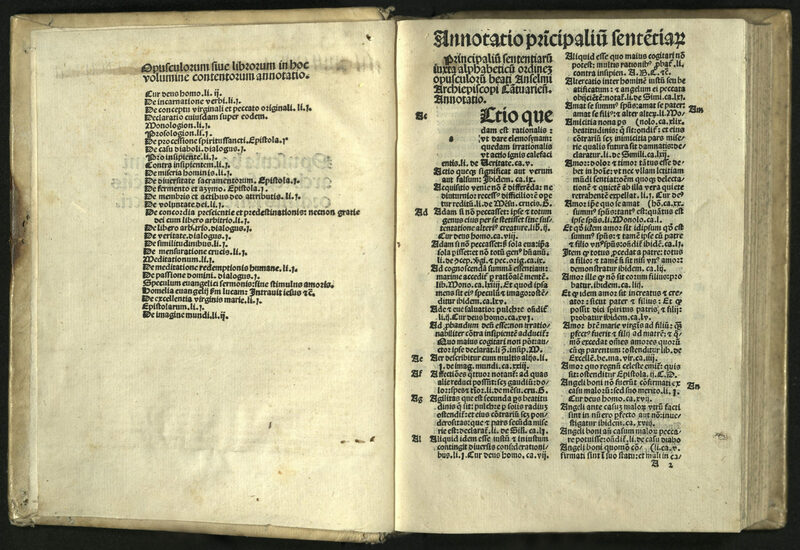 1440-1513) was the first printer of Basel to use a Roman type as well as Gothic. 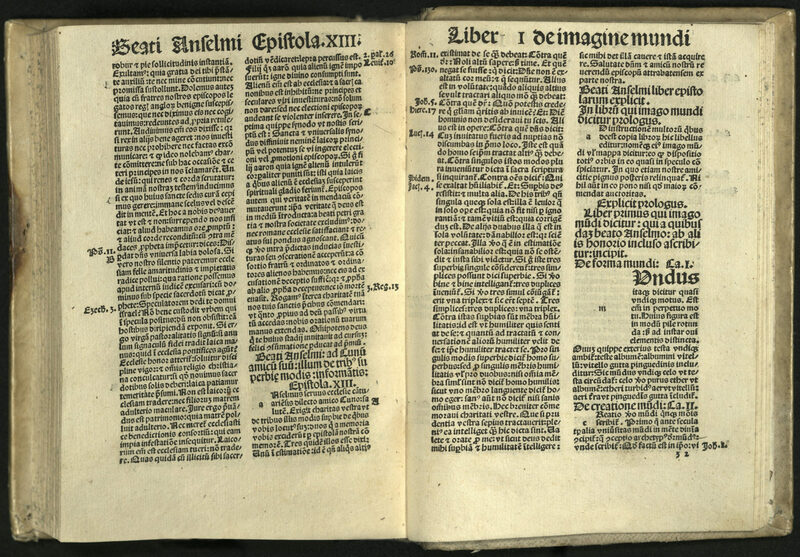 Printed in two columns of fifty lines each in Gothic type. University of Utah copy bound in 18th century vellum over boards; brown stain on cover. An early ownership inscription is inked out, and a stamp erased from the title-page. Some contemporary marginalia.